Tonight is the start of Rosh Hashanah, the Jewish New Year (5778). L'Shanah Tovah--I am wishing all of my friends a sweet new year. This is the card I sent to family and friends this year. We celebrate the new year with the symbols of apple and honey, to signify our hopes for a sweet year. This year, I focused on the apples. I dug deep into my stash for the apple stamps from PTI Fruit Fusion, and paired them with a newish set, also from PTI--L'Shanah Tovah for my sentiments. And, I used a brand new die (Brushed Off Rectangle) for the first time to get that fun kraft mat. 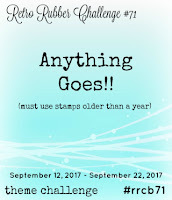 I am entering this card at Retro Rubber #71: Anything Goes. The apple stamps are at least 5 years old--could be older--and the sentiments are 2 years old. I am also playing along at The Paper Players #362: Clean and Simple Harvest. Of course, the apples are what I am harvesting this fall. I hope your new year is filled with sweetness Joyce!! Your card is perfectly adorable! I love these little apples, but that background die...I need to go find that! Lovely CAS creation! 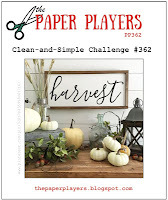 Thanks for playing with my harvest challenge this week! This is such a charming card! When I saw how you placed the apples, I hit myself on the head :) 'Why didn't I think of that?' They look perfect with your Kraft mat in the background, too! A lovely card for family and friends! L'Shanah Tovah, Joyce! I wish you and your family a New Year filled with good health, peace and happiness!!! Joyce, PTI is featuring this brushed off set today in their Throw-back Thursday feature - just sayin'- this is fabulous, and fitting! A year sweet as honey, to you, my friend! Red and kraft, a winning combination, Joyce. Wishing you a wonderful year filled with peace and joy. Fabulous card, Joyce! Wishing you a wonderful year ahead, full of sweetness and love! Hello Joyce: Love this card, the bright red apples and the kraft card stock are a beautiful combination, that rectangle die is to DIE for, love it!!! Wishing you and your family a very Happy New Year!! Thank you for sharing with us at RETRO RUBBER, I hope you play again next time. That brushed off Kraft mat is wonderful! What a great contrast for your bright apples. They look so good. It's a lovely composition. 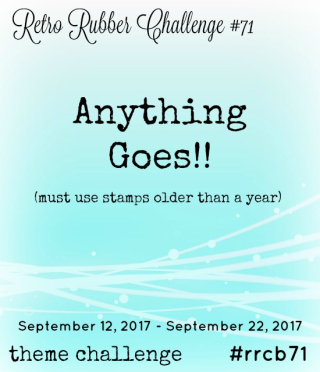 Thank you for joining in at both Retro Rubber Challenge and The Paper Players this week. A lovely card Joyce, and that stamp is classic! Shanah Tovah to you!